From the foothills of the Himalayas, golden in colour with a light, mellow flavour. Elegant and floral, Darjeeling is prized for its delicate flavour and makes a perfect afternoon tea. Darjeeling is prized by connoisseurs for its elegant, floral notes. It's best drunk without milk, and makes a perfect afternoon tea. This orthodox blend has a subtle, delicate flavour. 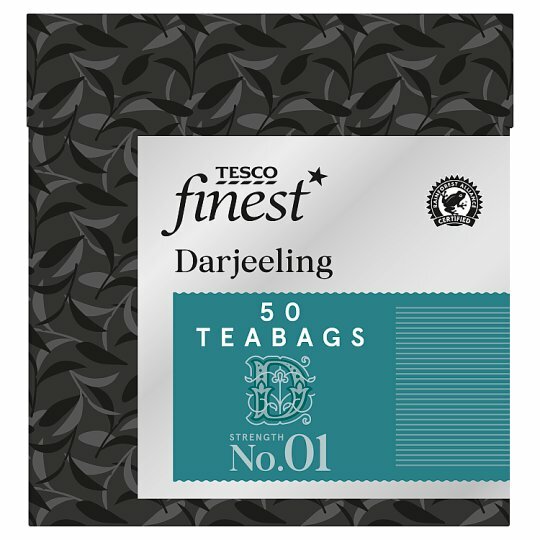 Darjeeling is prized by connoisseurs for its elegant, floral notes. It's best drunk without milk, and makes a perfect afternoon tea. This is an orthodox blend meaning the tea is produced in the traditional way, by gently rolling the leaves. Tea made using this method has a subtle, delicate flavour. Only the highest quality tea leaves are used to create each blend of Tesco Finest tea. They’re sourced from the world’s lushest tea gardens, renowned for their exceptional flavours. Each blend is then perfectly balanced to bring out its characteristic flavour profile. Our tea master ensures every blend is of the same great quality.